The New Year’s Day wheelbarrow race will once again be held to welcome 2017. 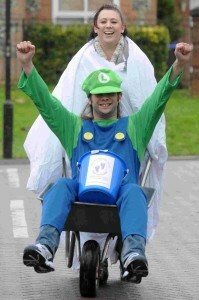 We look forward to another fun fancy dress event with medals for all participants, prizes for winners of Best Dressed Team and Wheelbarrow, for the Winning Team and for the team collecting the most sponsorship. We will also be serving up a chilli and Mulled wine just around the corner to help you refuel afterwards ! Wheelbarrows are available if required courtesy once again of Homebase, without which we would be unable to hold this event and are extremely grateful. Please do advise us in advance if you would like to borrow one to dress up. As this is a charitable event then we would be delighted if you would like to be sponsored for the race and sponsorship forms are available to download from the website www.harveywarrentrust.co.uk or otherwise we would ask for a donation to help the trust and for all it benefits.